Its not everyday you blow your food budget on buying skin care at the supermarket, or at least it shouldn’t be. But when my flatmate bought home the lilac body lotion from the Anatomicals skin care range, I became a little obsessed. Flash forward to Edd’s shocked face when I loaded up our trolley with these beautiful items instead of our normal vegetables. Necessary purchases (promise). Seriously though, after loving the scent and moisturising ability of the lilac lotion I wanted to try a few other products and then see how they fared with my sensitive and rather unreliable skin. This would be my least favourite of the 4, but still something I would happily repurchase. Although it doesn’t last too long, this scrub is scented pretty substantially with melon (I get a honeydew scent but my melon smelling abilities may leave a lot to be desired) so if you aren’t a big fan of those kind of scents…get another scrub. The reason I did enjoy this pumice body scrub was because although it does the job well it wasn’t too harsh on my skin and I find I can use it a couple of times a week to keep my skin smooth without it freaking out. I love to focus this on my legs where the skin can use a bit of extra help. The hand creams I have tried are my favourite products in the brightly coloured offerings by Anatomicals and of the hand creams this fruity one is my absolute winner. Seriously, this ticks every single box for me with a hand cream. Apart from the fact that it smells like I washed my hands in fruit salad (in a delicious way…not a gross way), this absorbs super quickly into the skin making it perfect to apply during the day. Despite it being fragranced, it has never irritated my skin like some other hand creams. If you don’t like strong scents then you might prefer the next option, but for me its perfection and people around seem to become obsessed with the wonderful smell of fresh papaya. Lastly, I grabbed a body lotion to try and get a bit of a feel for a few different products (just the essentials…). I was tempted to pick up the lilac lotion which I already know I love but chose to try this one instead and it was only partially because I love blue. The body lotion is good but didn’t blow me away as much as the hand creams. It’s a pretty light moisturiser but still gives my dry skin plenty of hydration. Again, because it’s not super thick it absorbs quick and doesn’t leave any greasy residue. The vanilla scent is delicious and to my pleasant surprise its not too overpowering and is quite subtle once it settles into the skin. The products in the anatomicals range are priced between $9.99 to $11.99 which is not on the crazy cheap end (especially when paying $11 for a hand wash) but for me is pretty acceptable considering how much I love the quality of the product and the overall branding/packaging (I’m a sucker for good container, a delicious smell and a funny pun). Apart from the fact that everything looks amazing, smells incredible and has hilarious little backstories, the products do the job well and nothing irritates my unreliable sensitive skin. This automatically gives them a giant tick in my book. The hand creams are my pick of the products tried so far (and may be the only hand creams I buy from now on) but there was nothing disappointing and I’m already planning my next purchase.These can all be picked up at your local supermarket which is great because its so handy but also terrible because its so easily to accidentally chuck a whole heap into your trolley to hide amongst the cauliflower. Check out Anatomicals over on their website or on the New Zealand Facebook page. 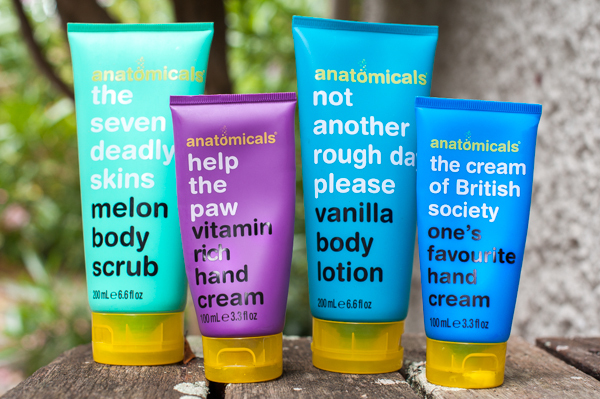 Have you tried any of the Anatomicals range? If so what did you think? *This post was not sponsored and all of the products were (unfortunately) paid for in lieu of real groceries.